Are you using dynamic content to convert your leads into customers? If not, you’re missing out on a valuable tool. Dynamic content for the purpose of email marketing is sending different content to different prospects based on the information you know about each prospect. It’s the same concept as visiting an online retailer and seeing recommendations based on items you’ve previously viewed or purchased. If the recommendations that pop up on your screen are appealing, you may be tempted to make an additional purchase; but if they’re totally off base, you’re probably going to just move on without buying anything. The point of dynamic content is to create a customized experience for each prospect, so the prospect notices that you care and doesn’t feel like another person being processed through a machine (even though it is automated). Have you ever learned Spanish before? Why are you interested in learning Spanish? Ideally, when a prospect comes across this form, he’ll put in his contact information and select the appropriate answer to each question based on options from a drop-down menu. Based on his answers, the user will then get an email in which every paragraph is customized based on the responses from the web form. Let’s compare two different versions of the same email based on the questions and responses above. Question: Have you ever learned Spanish before? Question: Why are you interested in learning Spanish? We see that you’re just starting to learn Spanish in time for your upcoming trip. Our classes will help you understand the basics so that you can enjoy your travels and have an easier time feeling comfortable with your surroundings. Call or sign up online today to get started with our beginner’s course. We see that you’re an advanced Spanish speaker. Our classes are designed for expert speakers like you. We’ll review the most complex concepts, focusing on key areas such as grammar and vocabulary, so that you can excel academically while also mastering skills that will be useful later in life. Call or sign up online today to get started with our advanced course. See what just happened here? Two simple questions generated two totally different emails, and it was all done automatically. 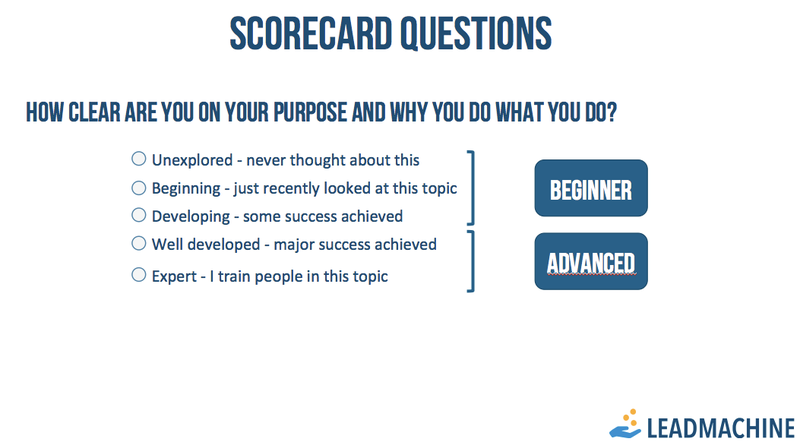 Now let’s take another example, this time using an online survey for a leadership program. 60% of users tend to opt in for these types of surveys, and once they’ve taken the time to enter a series of answers, they’re going to want to see their results. How clear are you on your purpose? To what degree do you feel you inspire others? From there, every report that’s generated is personalized based on the responses given. For the beginner, a simple strategy is sent. For the advanced professional, a more advanced strategy is sent. And each of these components is critical when it comes to converting leads. People want to feel recognized. They want to feel like individuals. That’s why even little things like addressing a recipient by his name can go a long way. Furthermore, email content needs to be relevant and reasonably interesting if you want your users to actually read your messages and take action based on their contents. If you send a message to your entire contact list that sounds auto-generated, most recipients will not react, or worse they might start deleting your emails. On the other hand, if you engage your readers and draw them in by addressing their specific needs or concerns, you’re more likely to see them call or sign up for your service. 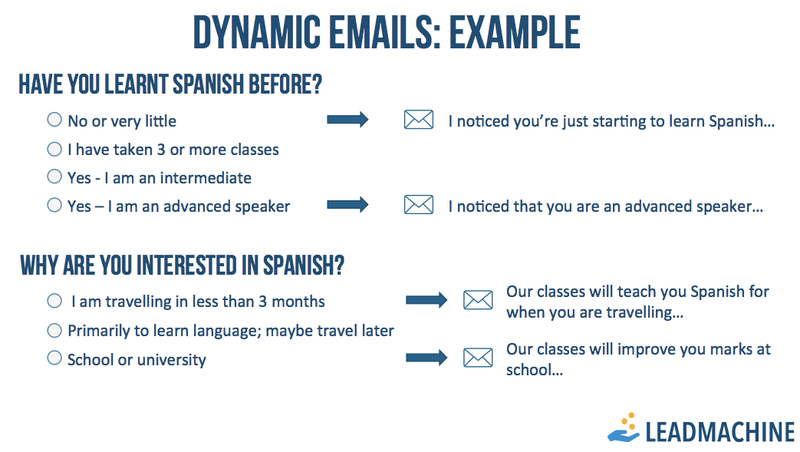 And the best part about using dynamic content in emails? Once you set it up, it you’re done. You get the benefit of personalized messaging without having to spend the time or money targeting leads as individuals. It’s an extremely efficient way to manage and optimize your marketing campaigns. Outstanding content material. Just what I was trying to search for!